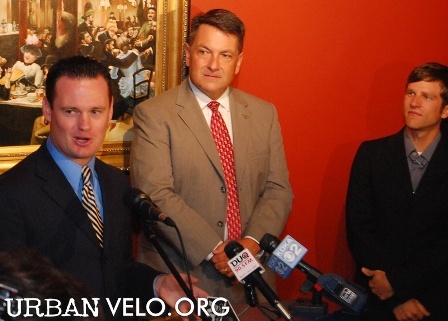 On Monday, August 11th at 10:30 am, Mayor Luke Ravenstahl and Councilman Patrick Dowd along with an impressive group of other policy makers and implementers will be holding a press conference at Tazza D’Oro to announce the City’s plan for a progressive Bicycle and Pedestrian Initiative. The City has recently hired a Bicycle and Pedestrian Coordinator through a grant from the Mellon Foundation. This position will help the city look at how to make the city more biking and walking friendly for recreation and commuting. This Initiative is designed to address traffic, engineering and infrastructure improvements along with the enforcement of traffic laws to encourage and protect walkers and bikers in the city. Folks, this plan is about implementing an aggressive strategy to look at alternative modes of transportation, providing city-wide events for cycling and walking and education – raising our QUALITY OF LIFE in Pittsburgh! 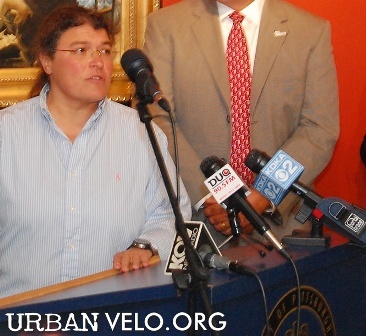 I was originally asked to be a part of the press conference as a business owner and someone who wants to see more walkers and bikers in my city. But Tazza D’Oro, over the last nine years, has had such a strong influence on biking and walking that Councilman Dowd and the Mayor thought the venue was perfect for their announcement. So, Monday at 10:30 am could be a little difficult to make, but if you have any flexibility, I say show up – hear the plan, hear the strategy, participate, and help be a part of making huge change for our quality of life in da burgh and let’s celebrate that we are witnessing a new way of thinking! Someone pinch me – Pittsburgh? Biking and Walking Initiative? YEAH!!! Mayor Ravenstahl and Councilman Dowd you are now official members of the Tazza D’Oro “You are Rad” list. Guys, you should know this list is really hard to make! Update: Well over 50 people attended the Mayor’s press conference at Tazza D’Oro. It was an amazing day to hear and think about raising our quality of life in Pittsburgh. Councilman Dowd and the Mayor’s initiatives are totally progressive and forward thinking! See video or article. Sounds great. Time is tough but I'll be there if I can. Thanks! Wonderful! Wonderful! Wonderful! I was unable to make the press conference, but I heard it was awesome. Hats off to Amy for her foresight and vision!